Hythe Quay01621 856503work MarinaFor well over a thousand years Hythe Quay has been the gateway to Maldon for vessels arriving from the sea. In recent years its importance as a place of trade has been eroded, however many of the familiar commercial barges remain, offering pleasure cruises and day trips. From the award winning Promenade Park to the pubs, restaurants and shops of Maldon High Street, Hythe Quay is a 'must see' for any visit to the district. 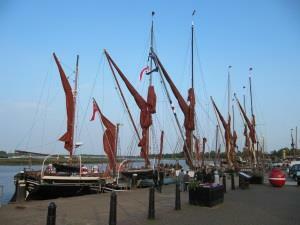 For well over a thousand years Hythe Quay has been the gateway to Maldon for vessels arriving from the sea. In recent years its importance as a place of trade has been eroded, however many of the familiar commercial barges remain, offering pleasure cruises and day trips. From the award winning Promenade Park to the pubs, restaurants and shops of Maldon High Street, Hythe Quay is a 'must see' for any visit to the district.